The Muslim community in Wilkes-Barre, Pennsylvania is tightly connected through faith and brotherhood. Although from many different countries and backgrounds, they are united through Islam. where Muslims gather for food and fellowship. Jameel Ahmed, 81, originally from Kirachi, Pakistan, kneels to pray after the formal service in the Masjid Al-Noor mosque in Wilkes-Barre, Pa. Many local Muslims immigrated to Northeast Pennsylvania to escape political strife and conflict in their home countries and to seek a better life. Maliha Uddin, 2, clings to her father Forkan’s leg before Friday afternoon service at Masjid Al-Noor. Forkan immigrated to the US from Bangladesh 30 years ago. Men pray during service at Masjid Al-Noor. 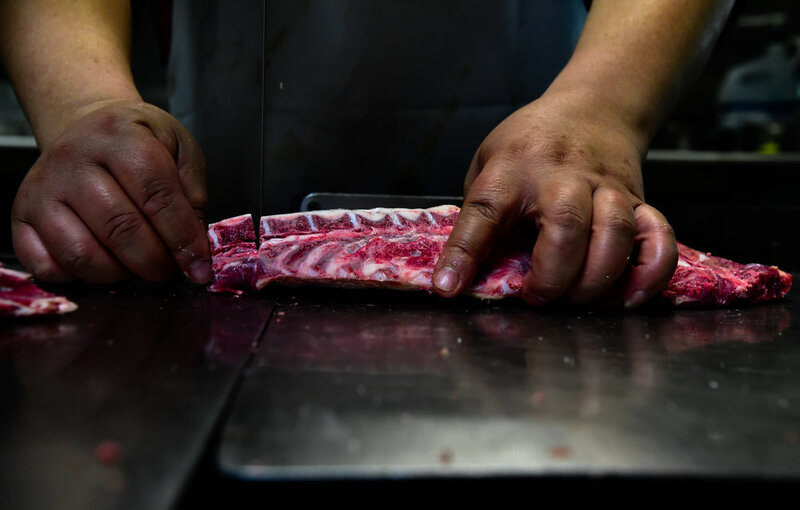 Employee of Jerusalem Halal Market Mohamad Mandou, originially from Homs, Syria, cuts goat shoulder for a customer. Mohammed Almarhoon, grabs food from the buffet on a busy Friday afternoon at Jerusalem Halal Market. Many Muslims make a stop at the market after service at the mosque. From left, Mohammed Almarhoon, his brother Hussain, Hidar, Hussain, and Ali (not pictured), all family from Saudi Arabia, dine at the Jerusalem Halal Market. The types of food available are an okra stew called Bamieh, Goat Briyani, seasoned potatoes and lavish bread, as well as many other Middle Eastern dishes. 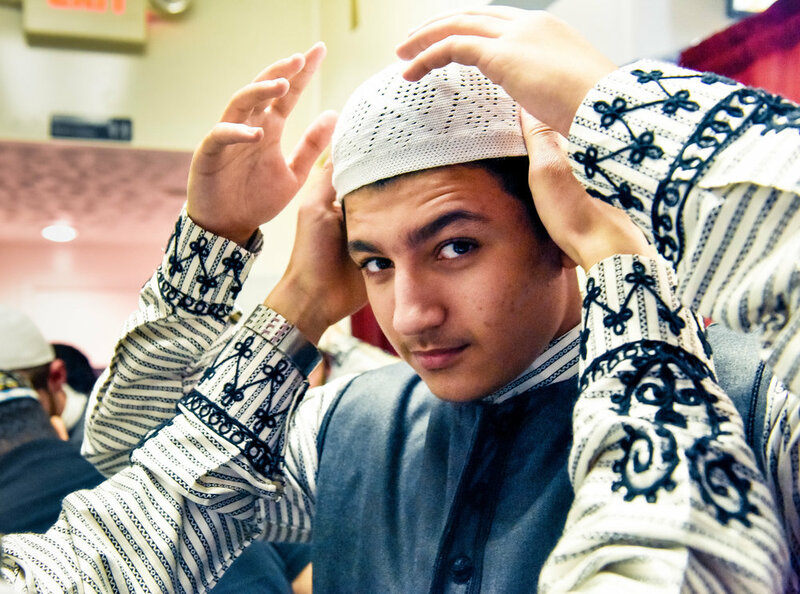 Abdul Rahman Allouz, 14, has help putting on his kufi cap from his older brother Anas at Tazza Shawarma and Mediterranean Gril in Wilkes-Barre, Pa. To celebrate the restaurant’s grand opening on May 5, 2018, men dressed in traditional Syrian clothing and performed music for a crowd of people. Syrian men perform music and dance during the grand opening of Tazza Shawarma and Mediterranean Grill.